Located in southwestern South Dakota and northeastern Wyoming, the Black Hills National Forest covers 1.2 million acres. Elevations in the national forest reach as high as 7,200 feet. Featuring the faces of George Washington, Thomas Jefferson, Theodore Roosevelt, and Abraham Lincoln, Mt. Rushmore reaches a height of 5,700 feet. Started in 1927, the 60 foot high faces took 14 years to complete. 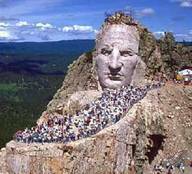 Started over fifty five years ago by sculptor Korczak Ziolkowski; Crazy Horse Memorial is a work in progress and will be the world’s largest mountain sculpture at 641 feet long and 563 feet high. The oldest, largest, and deepest mine in the Western Hemisphere, Homestake Gold Mine closed in 2002. The mine is currently being renovated to be an underground national laboratory. At 8,000 below the town of Lead, the mine will prove a perfect location for a Deep Underground Science and Engineering Lab (DUSEL). 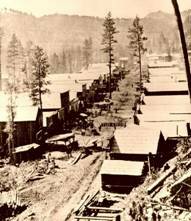 Deadwood, incorporated in 1876, was named for the dead trees that were found in the narrow canyon, now Main and Sherman streets, at the center of town. The city was founded following the discovery of gold in 1876, and contains the cemeteries of many famous historical figures including Wild Bill Hickok and Calamity Jane. Formed millions of years ago, this formation is sacred to many American Indian tribes. A National Natural Landmark, artifacts dating back 10,000 years have been found near the formation. 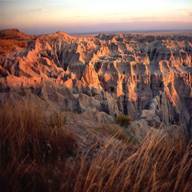 A fossil bed dating 37-28 million years old, the Badland are 244,000 acres of colorful buttes and spires. Various animals roam free on the national park, including bison, bighorn sheep, black-footed ferrets, and swift fox. 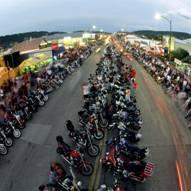 The Sturgis Motorcycle Rally occurs the second week of August. 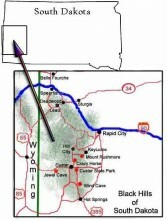 During this time, the sleepy little town of Sturgis, normal population of 6,400, grows to a population of over 500,000. Started in August 1938 by the Jackpine Gypsies Motorcycle Club, the rally crowd has swelled over the last 20 years, with various events occurring throughout the Black Hills and into Wyoming.